Yeah, yeah. I know. I haven't been around in a while. But it's not my fault. Somebody has apparently been speeding up time while I wasn't looking, and now weeks go by at the same pace it used to take a day or two. Whoever's doing that -- STOP! Just stop it now! So, I wanted to give you a heads-up about the upcoming release of the first Ciel Halligan short story. It's a prequel to the series, and it's called Pre-Fix. (Get it? Ha-ha!) If you've ever been curious about how Ciel got her start in the fixing biz, here's your chance to find out. Or, if you know someone who hasn't started the series yet, this might be a good way to introduce them to it (and earn my undying gratitude at the same time). 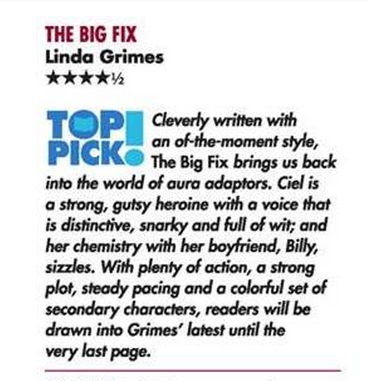 Oh, and as long as I'm sharing happy stuff, I just found out that RT Book Reviews has made THE BIG FIX a Top Pick! Heck, now I don't even mind (much) that it's snowing/sleeting here on the freaking first day of spring. To quote my daughter, "Spring, you had one job..."
Anyway, that's all for now. Hope you all are doing well. If any of you have any good ideas about how I can slow down time, please tell me in the comments. Cool! I just pre-ordered mine, too! As for slowing down time, good luck with that. The hands on my clock are spinning so fast, I don't need a fan. Yeah for the great review - you deserve it. Can't wait to read the prequel Pre-Fix. Digging the title. You are missed when you're not around. So stop it, and focus on blogging. Really, just because you're a 4 1/2 star author doesn't mean you can neglect us. Okay, on a less serious note. I just ordered Pre-Fix. I look forward to reading the pre story. This will sound really bad, but I was sure I bought your first book for my kindle, and even read it. But, I can't find it anywhere, not in the cloud (where my head usually is) and not in my list. Weird. I'm looking forward to the release date of this one. And if I can't find the first book, I'll reorder it. Wishing you lots of success with it too! Yay for you and Ceil all the way around!